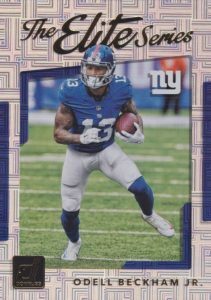 As one of the longest-running brands under the Panini banner, 2017 Donruss Football balances the familiar with some newness in a moderately-priced package. 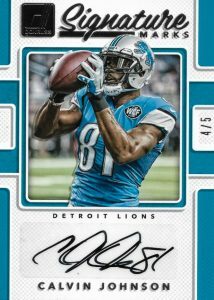 Like the 2016 product, hobby boxes promise one autograph, one relic and a ton of rookies and inserts. 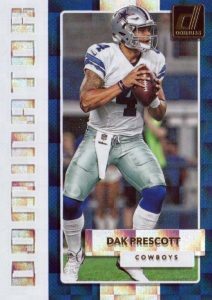 Establishing a large collecting foundation, the 2017 Donruss Football checklist lays the groundwork with a 400-card base set. 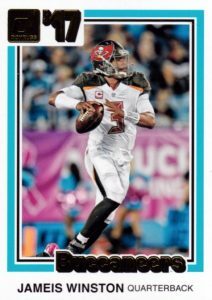 Of course, the popular Rated Rookie and Gridiron Kings cards are back in action, as well. 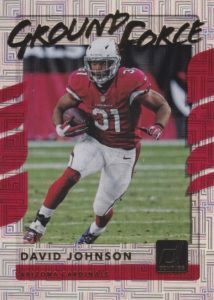 Donruss is not all about the established lines, however, as new inserts like Ground Force, Salute to Service and Up Tempo enter the mix. 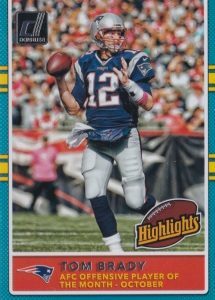 In addition, the retro-based 1981 Tribute and Highlights sets make their debut. 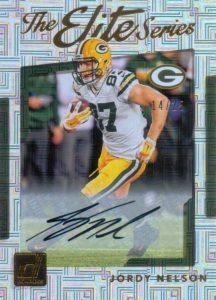 Featuring two hits per hobby box, Donruss works in several autograph and relic choices. Signed inserts include Rookie Phenom Jersey Autographs, with limited Prime and Tag parallels, alongside All-Time Gridiron Kings Autographs and Signature Marks. Meanwhile, Donruss Threads is one selection from the memorabilia offerings. 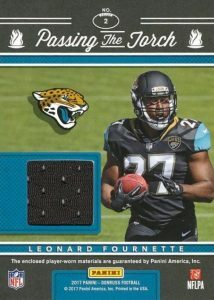 Finally, there are other 2017 Donruss Football formats available, including blasters with exclusive box-hit memorabilia cards—Rookie Phenom Jerseys and Rookie Threads—along with team set blisters. 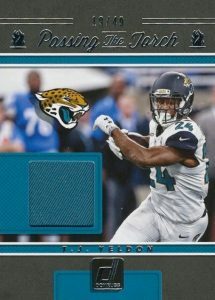 There is also a factory set that includes all 400 base cards along with an exclusive Rookie Threads Green insert. 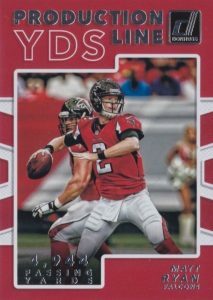 Individual team sets let collectors obtain the full base assortment for their favorite squads with ease. 400 cards. Shop base sets on eBay. 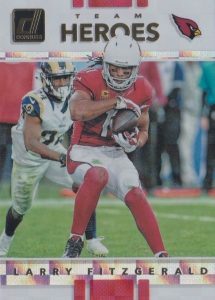 PARALLEL CARDS: Aqueous Test, PP Bronze (3 per Mega Box), PP Blue, PP Green, PP Red, Season Stat Line #/400 or less*, PP Silver #/100, Jersey Number #/99 or less*, PP Silver Die-Cut #/75, PP Gold #/50, PP Gold Die-Cut #/25, PP Black #/10, PP Black Die-Cut 1/1. View specific parallel numbering with the full spreadsheet*. 99 cards. Shop on eBay. PARALLEL CARDS: Blue #/25 or #/5, Yellow #/5 or 1/1. *Marshawn Lynch found only in parallels. View specific parallel numbering with the full spreadsheet. PARALLEL CARDS: Studio Series #/100. 29 cards. Shop one eBay. PARALLEL CARDS: Studio Series #/25. PARALLEL CARDS: Prime #/25 (Sproles - #/10, Bettis, Rice, Montana, Faulk - #/5). 27 cards. Serial numbered #/10. PARALLEL CARDS: Blue, Red, Prime #/25, Brand Logo Tag 1/1, NFL Player’s Logo Tag 1/1, NFL Shield Tag 1/1. 40 cards. Serial numbered #/99. Shop one eBay. PARALLEL CARDS: Studio Series #/10. 10 cards. Serial numbered #/99. Shop on eBay. 26 cards. Shop on eBay. 20 cards. Serial numbered #/49. Shop on eBay. 30 cards. Serial numbered #/99. Shop on eBay. PARALLEL CARDS: Prime #/25, Brand Logo Tag 1/1, NFL Player’s Logo Tag 1/1, NFL Shield Tag 1/1. I’ll only buy for the right price.. on rookie and rated rookie per pack is alright.. 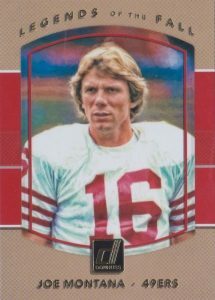 I used to buy NFL factory sets from Topps every year before they lost their license to Panini. 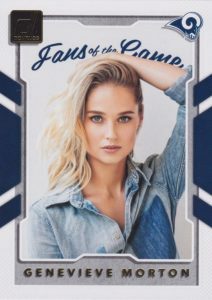 I was happy that Panini at least followed in Topps footsteps by producing a factory set for us everyday collectors who don’t really care for the inserts and do not want to throw down big money to collate all the cards needed for one. This years design doesn’t look nearly as nice as last years but I will still be getting one. 70-90 a box?! Are these dealers drunk? It’s funny, steel city collectibles is selling for 68 on their website and 78 on ebay (with free shipping!).. so, technically, you’re still paying for that free shipping.. bunch of liars.. this box ain’t worth no more than 50-60..
Good to see a ton of Dallas Cowboys players throughout this product. Over 19 different players! 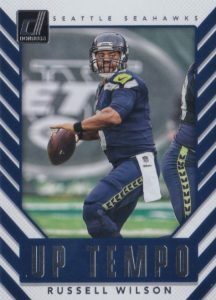 I’ll buy into a few breaks but for the price of $70+ for a hobby box, I won’t be buying one myself. Way too much. The inserts look great this year and you get something in every pack. 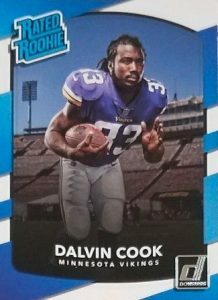 The rated rookie photos are fantastic. I love christian mccafferys rated rookie. That dude looks like a beast. Donruss is a very underrated set year in and out. Cant beat 70 a box when you get 40 inserts on top of 48 rookies per box. Disappointing to see all of the negative commentary here. Looks like everyone is in it for the quick hit and return. This product is a COLLECTOR’S dream. Massive checklist, loaded packs, lots of variety. I ripped a box and LOVED it. Fantastic value. Great product. 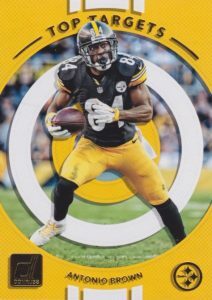 Tons of slick inserts, two hits per box and packed with rookies. Affordable , fun break. Great product for the money! Packed full of rookies, and hits. I have pulled autos of rookies and of HOFers. This product is one of the best for the money. I believe it’s a little pricey but the base variations and inserts are awesome. The hits are a plus but I really enjoy the base heavy product. Just enjoy the hobby and have fun. This is so so would getting a blaster box at $14 be worth it? as I do not want to spend $80 a hobby box. Always the best bang for the buck! Love all the inserts and always have fun opening hobby boxes. The Autos are a little generic but its a low end product and worth the money! Panini did something right for a change. Good looking cards for collecting. 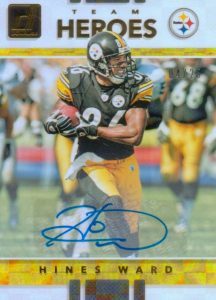 Got 3 of my Steelers from a blaster box so that isn’t too bad. Nothing major to trade away but that’ the chance you take. My question is: what is the Aqueous parallel? This product has been incredibly kind to me this year, and provided excellent value. As a collector from the UK I have to pick and choose my products due to costs, and in recent years have settled into getting one low-end product with a good base set and a few autos. Bought three boxes. First box gave me an A.J. Green ‘81 Throwback auto /25, a Roger Staubach jersey card /99 and a 10/10 Press Proof of Antonio Brown. Second box yielded a redemption for a Gridiron Kings auto of Le’Veon Bell /25 and a Demarco Murray Pro Bowl jersey card to /99. 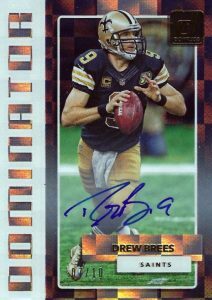 Final box and I thought my luck had run out when I pulled a Connor Cook jersey card /99, but a few packs later I pulled an /10 Drew Brees Dominator auto. Three boxes, three potential hall of fame veteran autographs. Base set is a bit jumbled in terms of order, but look nice enough. 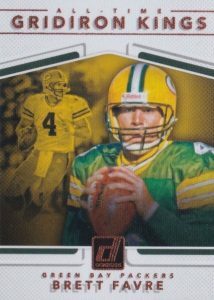 Inserts are cool if perhaps spread across too many series, but the The Rookies series cards are beautiful, as are the Gridiron King and ‘81 Throwback cards. Very pleased with the product as a whole, and glad I chose it this year over my usual Prestige purchase. Shane: Pretty sure those are the exclusive parallels from the retail Mega Boxes. You get three per $19.99 box. It is nice to see Donruss continue the box sets. Their photography/photos are very good. I think where they fall short is on information. No player has their position listed. There is no draft information regarding each player or where they played college ball. 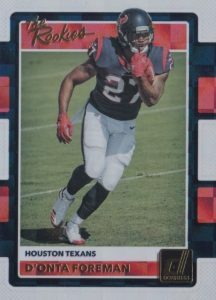 I think Topps did a much better job giving player information. 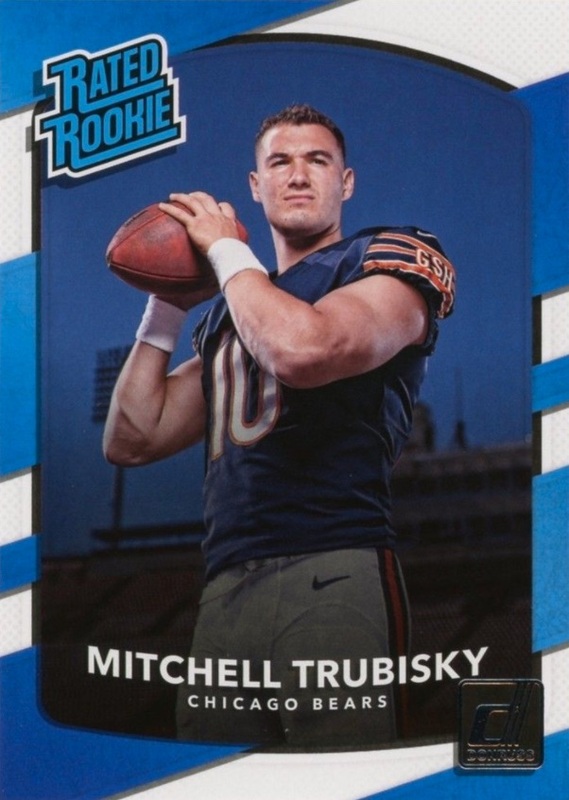 Rated Rookies cards are nice, you understand what they represent. 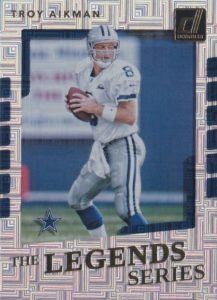 The Legends cards should have a distinguishing title that sets them apart, they look like every other current players card. 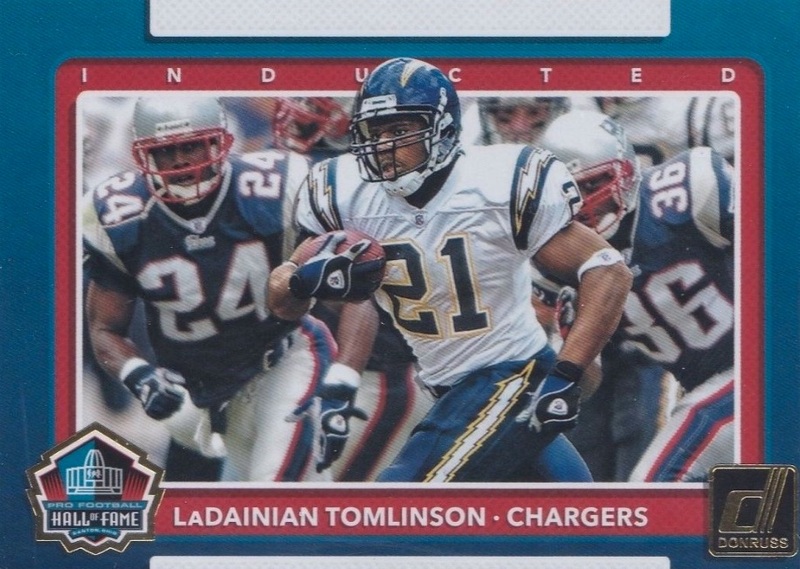 Would love to see All-Pro’s also be recognized on their card. I think the product could be so much better. I like the inserts. Card design pretty standard for Donruss. My beef is I have almost a 5000 ct box full of this product and I need 2 damn cards to finish the set. That is stupid to say the least. What’s even dumber is the $$$ I spent trying to finish this thjng. eBay would’ve saved me a ton. I’m still 2 short. Cmon Panini. Haven’t collected cards since I was a kid, just got the bug and picked up a hobby box. 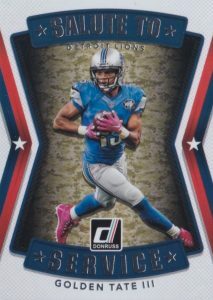 Donruss has upped it’s game a lot since 1991!